KlipFolio is a personal dashboard. Small, consistent and easily configurable, KlipFolio can be used to monitor anything you want online--like weather, stocks, email, news, RSS feeds on your desktop. 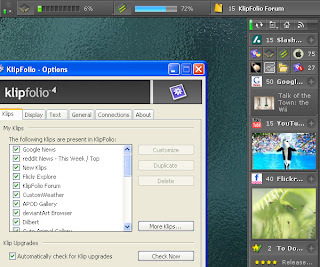 It has many different kind of information services which called "Klip", you can download "Klip" on KlipFolio. After did that, it will appear on your screen. It is really cool. If you like you can download here.